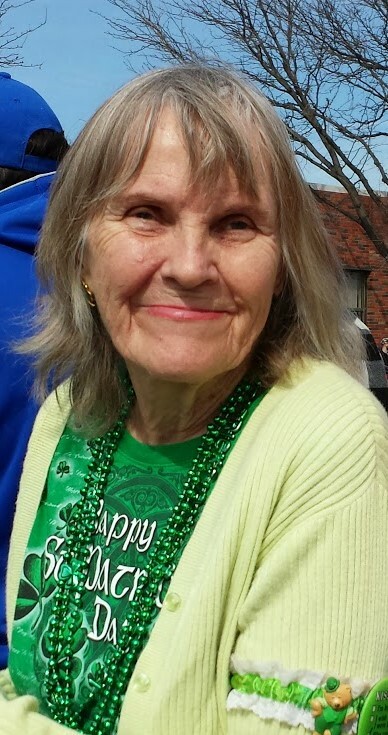 Eleanore Marilyn Lewis, 81, of Kansas City, MO passed on August 19, 2018 surrounded by her family. Visitation 6-8pm Aug. 24, Funeral 10am, Aug. 25, both at Park Lawn Funeral Home, 8251 Hillcrest Rd., Kansas City, MO. Preceded in death by her companion John Mazikewich, her parents, her daughter Lynne Marie Lewis and her ex-husband Fred Lewis, Sr. Survived by her children: Penny Sexton (Wayne), Fred Lewis, Jr., Cathy Lewis, Andy Lewis, Bobby Lewis, Jimmy Lewis (Christine), Tilda Londre (Tristan), Karen Rohan, Susie Nowatzki (Joe), Cindy Lewis, Donny Lewis, Amy Van Wagner (Michael) and Jenny Hyder (Eric). Her grandkids: Brian Lewis, Jessie Lewis, Emma Taylor, Marissa Agueros, Syd Parrish, Sarah Lewis, Hayley Houchen, Taylor Nowatzki, Presley Lewis, Sierra Lewis, Gage Rohan, Graham Londre, Matt Lewis, Parker Sexton, Henry Londre, Caleb Lewis, Cameron Duffin, Tanner Nowatzki, Sophie Lewis, Ellie Londre, Gilbert Londre, Kennedy Lewis, Cassidy Duffin, Addy Londre, Maddie Van Wagner and Jacob Van Wagner. Her great grandkids: Eric (Cain), Tavious, Chandon, Desi, Eli, Tulsi, Briar, Weston, Grant, Mary, Brooklynn, Delaney and Charlotte. Her great-great grandkids Roman and Romeo. Also survived by her sisters, Joan Trauernicht and Carol Protzman, and many nieces and nephews. Eleanore was born on February 20,1937 to Anders Peters Andersen and Helen Marie (Stankus) Andersen. She grew up in the Logan Square neighborhood of Chicago, Illinois. She enjoyed swimming in Lake Michigan in the summer time and ice skating at Lincoln Park with her dad and sisters in the winters. She attended Harriet Beecher Stowe elementary and St. Aloysius schools while in Chicago. In her early teens she moved with her family to Mountain Home, Arkansas where she attended Mountain Home Senior High school and also where she met her future husband, Fred Henry Lewis, Sr. They married and started their family of eventually 14 children. Eleanore worked with her aunts and grandma at the restaurant her family opened in Mountain Home called the Redwood Lodge in the 1950’s. Her beloved Auntie Delores ran the restaurant. She spent a large part of her life raising the 14 kids she had with Fred “Henry” Lewis. They moved to Kansas City, MO in 1959. For 19 years she had children and raised them. She worked as a mail clerk at the Federal Building downtown from 1985 until her retirement there in 1999. She took pride in her time there and the work she did there. This job helped her build her independent life after raising her kids. Eleanore had many hobbies, including dancing (especially line dancing at country bars), camping, roadtrips, riding bikes, bird watching, puzzles, cross stitching, canoeing and kayaking, anything involving nature and being outdoors. She had such an impressive photographic memory and knew every name of every relative which she brought to life with her stories about them if she knew them personally. She got to experience many of those hobbies with her longtime companion, John Mazikewich. He was her dancing partner, roadtrip partner, camping partner and confidant. John passed away 15 years to the day before Eleanore’s passing. They are dancing together again in heaven and maybe even enjoying a cold one. Her greatest accomplishment was her giant, crazy, loving family of 14 children, 26 grandchildren, 13 great grandchildren and 2 great-great grandchildren. Her family was her pride and joy, everywhere she went she would tell people about them. Known as "Mama Lew" by many, she served as a second mom to many of her kid's friends. She made friends easily and quickly from young childhood up until her last days. Her fearlessness and adventurous personality made her irresistible to all who met her. She was always the life of every party. Faith in God was a big part of her entire life and she attended Catholic church every week. Our deepest sympathies to the Lewis family. May your memories bring you some peace and comfort. So sorry, Mama Lew will always be in our hearts with such great memories. We love you all, praying for God give you comfort. To the Sexton, Agueros Family and Hayley - I met your mom and grandma at Marissa and Adams wedding and have followed all the posts on facebook. She was one amazing woman that had so much fun wherever she went. She certainly was a blessing and one of a kind. She raised a beautiful family. God has blessed you all with a large family so you can all cherish and share the memories you made together. Please accept my deepest sympathy for you loss and know you have a beautiful Angel to watch over you all. She was my Great Aunt Eleanore, she even helped my family of us three kids and my mom for a short time in my childhood. I remember there being cousin's everywhere!!! I had a great time when we lived with all them Lewis's!! She's a lady that I will never forget! She will be missed! To Amy Van Wagner and family, our thoughts and prayers are with all of you during this time. Peace be with you. Dearest Amy, you and all your family have been in our thoughts and hearts. Your mother's life was one of love and resolve and determination, and you carry on her legacy with your grace, wisdom and compassion for which we hold you in awe. Her love is always with you and in you.